What are connected products? They’re not some science experiment coming to us in the future. They’re already a part of everyday life. Smart thermostats remotely control home heating and cooling. Printers automatically order new ink cartridges before they run out. Wearable medical devices capture data that helps drive health decisions. These products have one thing in common: They are practical, profitable applications of the Internet of Things (IoT), a tech sector that will generate an estimated $4 trillion to $11 trillion in revenue annually by 2025. Via internet connections, these products send massive amounts of data to the cloud where it can be crunched into valuable, actionable insights for users. Early adopters are realizing the advantages. The average revenue increase achieved from IoT solutions was 15.6 percent, with some achieving gains as high as 64 percent. To capture your share of this market by offering connected products, clarifying the right use case is the first big step. There are three main approaches: monitoring, control, and automation. Monitoring: Tracking a product’s condition, environment, and usage to enable performance optimization, alerting, and automated maintenance scheduling. 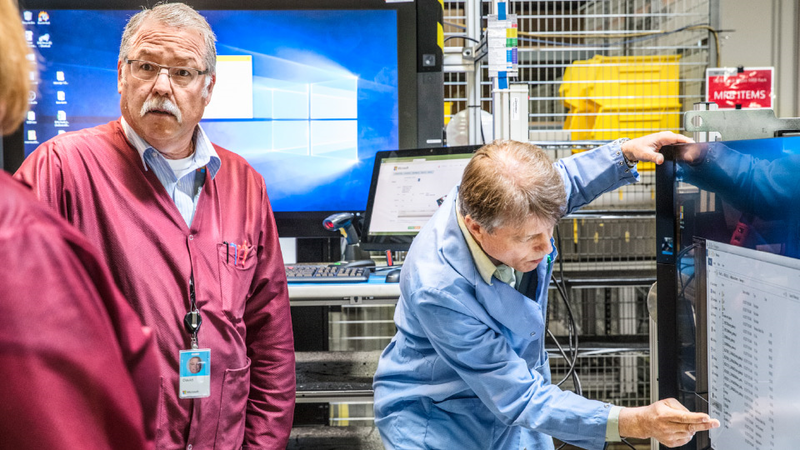 For example, Sandvik machining tools constantly send data to Azure IoT, enabling the company to identify and fix issues as a value-added service. Control: Remotely changing a product’s state or causing it to take an action. Omnivex, a leader in intelligent digital signage, designed its Moxie communications platform to run on Azure IoT, enabling visualizations to be updated remotely. Automation: Enabling products to coordinate and act without human intervention. Kohler Konnect has developed end-to-end home automation based on individuals’ lifestyles. Products work together seamlessly, such as when setting a bathroom’s morning air and water temperature and lighting. Companies that connect products using IoT can offer new product features and create new revenue streams. They use the data collected to personalize customer experiences, increase reliability, reduce costs, and learn how products can be improved. Businesses that once sold only physical goods are adding IoT-driven services to the mix, creating new lines of business by monetizing data or offering predictive maintenance. Internally, the data from connected products can drive new innovations based on usage insights — such as the way Rolls-Royce feeds data from its connected jet engines to its design and engineering teams. Although the revenue potential is huge, connected products require careful planning to succeed. Consider the unique requirements before you embark on a specific project — security being one of the most important. For example, one manufacturer of home automation systems released a product to the public that exposed its interface to search engines and didn’t require a username or password. A reporter was able to search online for homes with the system and take control of functions such as lighting. Insufficiently robust technology can also be a blocker. When users are relying on your connected products for important services, you have to guarantee reliability. A manufacturer of automatic pet feeders saw its service go down for half a day when one of its infrastructure partners experienced a server failure. Such incidents negatively impact customer trust and can cause significant reputational damage. The lesson is this: If you’re going to connect your products, do it right. IoT solutions have many layers, and making them all work well together is essential to success. That’s the subject of our next post in this series, where I’ll highlight best practices to help you enter this rapidly expanding market. For in-depth guidance on building a connected products strategy, read our white paper.